All Radio Amateurs and SWL dream about big beautiful antenna systems on arces and acres of property. 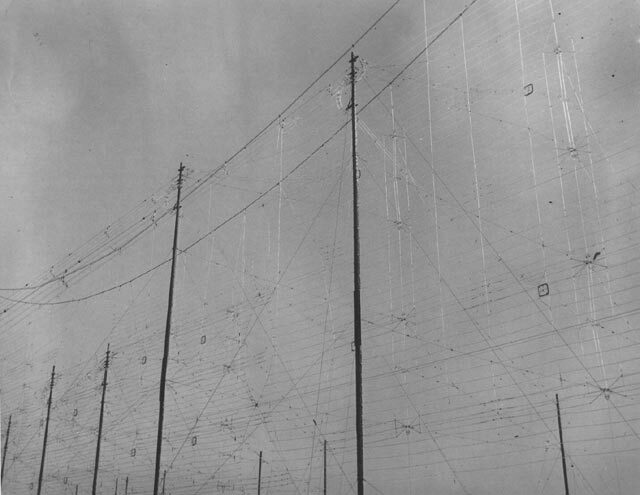 Perhaps a few multiple wavelength Beverage antennas oriented in different directions or rotatatable Pennant low noise receive antennas and for transmitting a few Rhombics oriented in different directions, a Log Periodic, multiple phased and switchable mono band beams on 80 through 6 meters at different heights on multiple two hundred foot or higher towers, or for that matter how about a few sterba curtain antennae as well ? Well all that I have ever had, past and present has had to fit within a half acre lot, my current lot is 178 feet across the front and wooded in the rear and adjacent lots East and North are completely wooded, thus I have done better here, but when I relocate to my next QTH it is my plan to have acres of property and two locations, the main residence and a remote site for my 24/7 ALE HF station and VHF/UHF FM repeaters. In the mean time, this page will provide some general info and in some cases complete details and photos on my antenna systems I have installed or under development. Nothing really spectacular yet as I am lot limited, however some of my antennae systems so far are interesting and work well, if nothing else. I have also acquired some very interesting and now rare commercial and military antennae over the years along with some of my own designs that that I use afield for travel (in the past) ARRL Field Day, MARS and just plain fun. At my current QTH I have worked with mostly wire antennas on HF from 1985 to 2000. I have done rather well with my wire antenna installations strung from my trees and my vertcals (both ground and tree mounted). I have a GAP DX-Voyager vertical, a full size 40m loop vertical loop (between two wide spaced trees) and receive only antenna consisting of a rotatable coax magnetic loop for 75/160m and a Pennant for 160-40m. 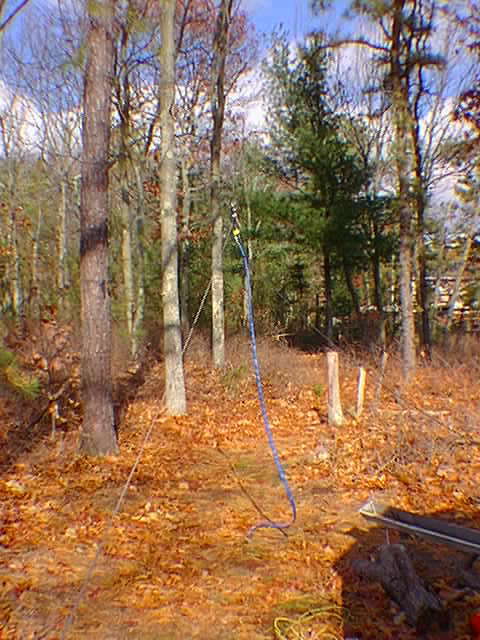 By late summer early fall 2005 I shall be adding a 2nd 40m loop, a rotatable Flag antenna and another 1/2 Rhombic a.k.a. Terminated Sloping V antennae. For broad band MARS and ALE NIVIS operations I have a 400 foot U shaped random wire antenna and a 450 ohm ladder line dublet both using CWS ByteMark 9:1 RF transformers, details are below. In the spring of 2000 my Beams-In-Trees project was undertaken that placed an A4S and A50-5S in an old oak tree. 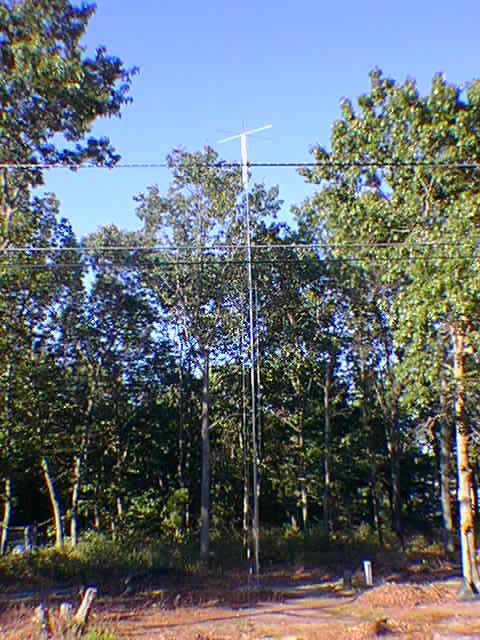 I also have a number of Super Station Master repeater station antennas in trees ! I always use heavy duty antenna components in all my home made antenna systems, such as Centaur and CWS ByteMark 5Kw baluns, 8 inch Johnson insulators and 12 gauge wire. I usually buy commercial antennas rated at least for full legal limit as well. These practices are not going change, especially with the occasional use of high power amplifiers. 160/80/40m Receive Antenna Home made Pennant point feed (860 ohrm termination) receive only antenna oriented 30 degress NW toward Europe. 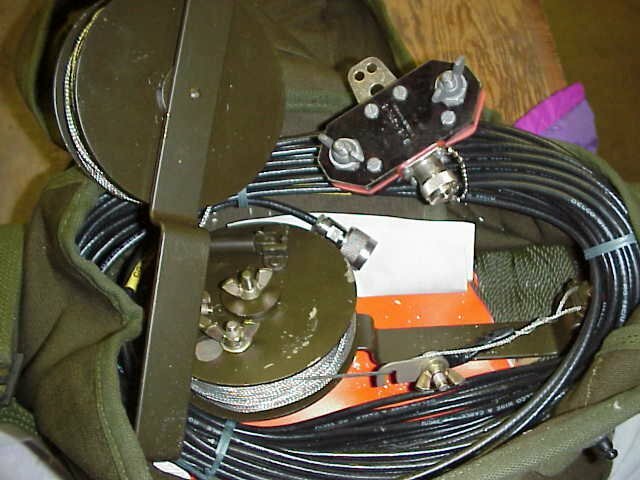 It is feed with 50 ohm RG-8X having a 12 turn, 12 inch RF Choke and uses a K1FZ KB-5 toroid matching transformer. 160/80/40m Receive Antenna Planned for the for the spring of 2004 is a rotatable Flag type Pennant receive only antenna. It will be feed with 50 ohm RG-8X having a 12 turn, 12 inch RF Choke and uses a K1FZ KB-5 toroid matching transformer. 160/80m Receive Antenna Rotable 160/80m coax loop antenna on a CD-45 rotor with the bottom of the loop about at about 12 feet above ground which clears my ranch home. 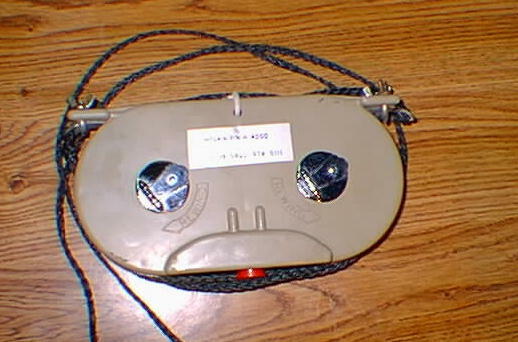 160/80/40/30m Alpha Delta DX-B Slopper with one 1/4 wave 160m ground radial used for transmit and receive at times that is moved between SE, N, SW to provide coverage of parts of South America through Africa, Europe, Asia and the Pacific. 160/80/40/20m GAP DX-Voyager 45 foot top hat vertical antenna. Used for transmit and receive on 20m and above (tuner needed above 20m) and on 40m and below in combination with my receive only antennae. 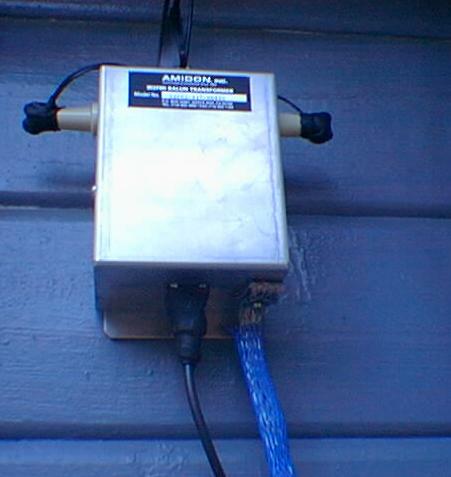 At the feed point of the antenna, buried under ground is an Alpha Delta TT3G50U-HP surge protector. 40/30/17m Inverted V This Centaur balun based multiband Inverted V is cut for 40/30/17m and is also useable on 15/10/6m as well on the 3rd harmonic. Up about 50 feet at its center in a pine tree it is broadside NE and SW made using Alpha-Delta CIN end insulators drilled for the three wires on each leg to pass through and made using 14 gauge wire. The antenna also has an Alpha Delta ATT3G50U-HP surge suppressor at the input to the balun using a Amphenol double male PL-259. NVIS Doublet Antenna Click here for a .PDF file with details on my NVIS antenna designs which I developed for improved MARS operations and low band rag chewing. It is basically an all band 450 ladder line feed dipole with 9:1 RF transformer outside and RG-214 cable into the house which supports automatic antenna tuner use 2-30Mhz, works great on 6 meters too ! NVIS Random Wire Antenna Click here for a .PDF file with details on my NVIS antenna designs which I developed for improved MARS operations and low band rag chewing. This one is basically a random wire antenna using 400 feet of 12 gauge stranded, insulated wire in a U configuration with 9:1 RF transformer outside where one end is grounded and RG-214 cable into the house which supports requires not antenna tuner from 3-30Mhz. The VSWR is less than 1.5:1 from 4Mhz on up and rises to 2.5:1 at 3.5Mhz which most radios will easily work into. 40-6m Half Rhombic Half Rhombic a.k.a. 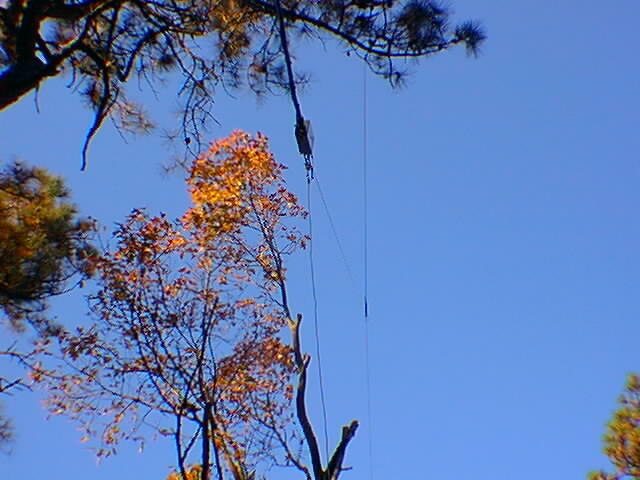 Terminated V-Beam with its feed point at 70 feet above ground oriented SW to provide coverage of the Pacific. Made using an Amidon 9:1-HB450 balanced to 50 ohm unbalanced coaxial 10Kw balun, 12 gauge 450 ohm ladder line, 14 gauge wire for the legs, a pair of Electro Impulse 300 ohm +/-10% 325 watt Non-Inductive carborendum resistors and a Ladder-Lock center insulator. From the balun into the house using RG-124. The antenna will also have an Alpha Delta ATT3G50U-HP surge suppressor at the input to the balun using a Amphenol double male PL-259. Until such time as I can secure greater wattage dissipation terminating resistors this antenna will be limited to 600 watts usage. 30m Home made elevated 1/4 ground plane with two ground radials. Use's 10 gauge jacketed wire and an Alpha-Delta ATT3G50U-HP surge suppressor and coaxial RF choke at the feed point. 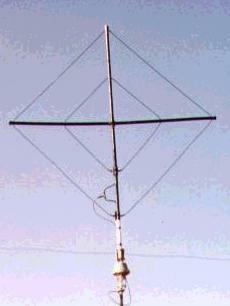 6m AEA Halo 6 at 20 feet. For Sporatic-E openings stateside it is best have up a loop rather than kill the old rotor. 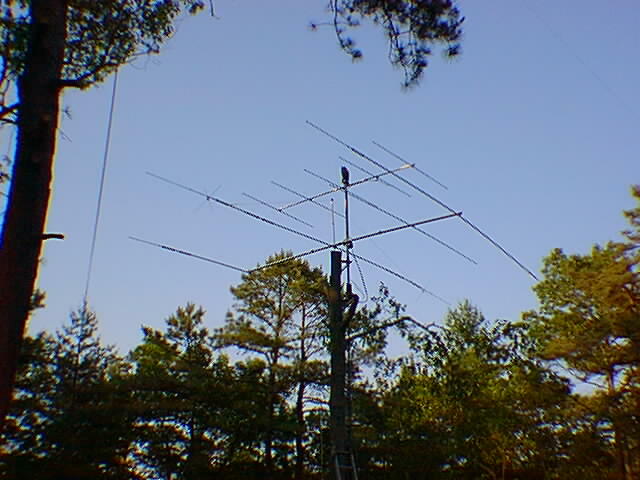 6m Cushcraft A50-5 5 element yagi's on 12 foot boom, one at 20 feet and one at 40 feet. 2m M2, 12 elements on 20 foot boom . 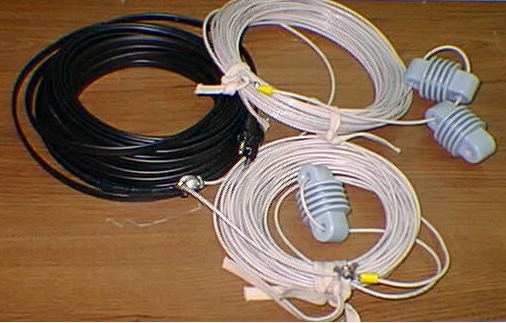 70cm AEA/M2 16 elements on 12 foor boom, antenna for ATV and terrestrial SSB/CW. 2m/70cm Telex Satellite antenna system with Yaesu G5400 az/el rotator on roof top tower. 80/10m 450 ohm ladderline with 130 foot flat top made of 12 gauage wire..
80-10m Depending on configuration N2CKH Travel Special 300 Ohm ladder line convertable antenna. 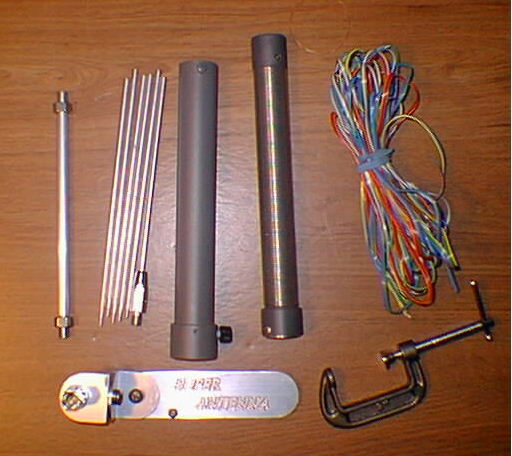 This lightweight antenna can be configured an 80m Dipole/Sloping Dipole/Inverted Vee or a 40m Delta Loop, 40m Folded Dipole or V Beam. For more information please click here to send e-mail. Entire contents Copyright © 1999-2005 by Stephen B. Hajducek, N2CKH. All Rights Reserved Worldwide.